1. Take 1 cup maida in a bowl. 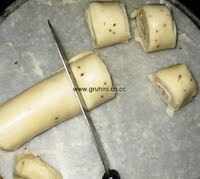 Add Ajwain (carom seeds) and salt to it. Heat 1 table spoon ghee in a pan and add to the mixture. Make a stiff dough by adding enough water. 2. 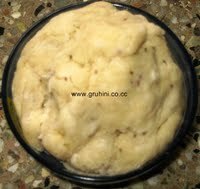 Leave the dough covered for 1 hour. 3. Now make lemon size balls out of the dough. Make rotis as thin as possible. 4. 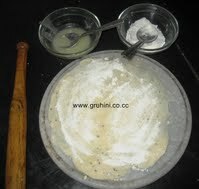 Now take a roti, spread ghee, and then sprinkle rice powder. 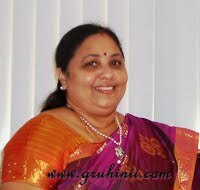 Place another one over it and spread ghee and rice powder. 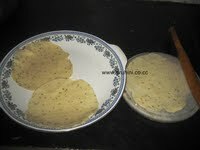 Place 2 to 3 rotis one over the other in the same manner. 5. 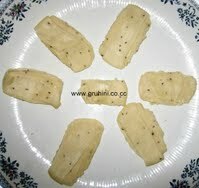 Now make rolls out of the Rotis as shown in the picture and cut into small pieces. 6. Roll over very care fully. 7. Now kajas are ready for deep fry. 8. 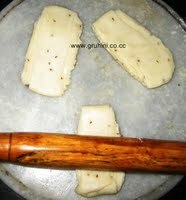 Heat Oil in a pan deep fry the kajas until golden brown. 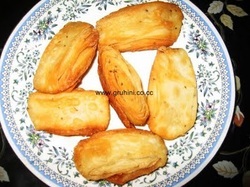 Crispy Namkeen Kaja is ready. Store in a air tight container after completely cooled. Tip : You can also make sweet Kajas in the same manner. 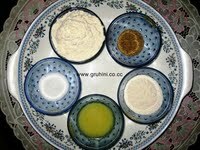 Just avoid adding Ajwain and chilli powder in the ingredients. After deep frying Kajas sprinkle grounded sugar for Sweet Kajas.